Many websites quietly log your IP address and everything that it requests; for example, search engines will keep a log of everything an IP address ever searches for, even if they aren’t logged in to a personal account. Websites can also see other information that you may not be aware of – they can tell where you are located based on your IP address and they can see what browser and operating system you are using. 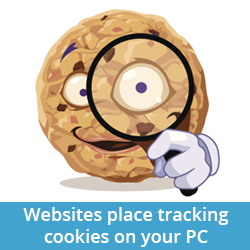 They can also track you after you leave the site by using a “cookie”, a small file that is deposited onto your computer automatically when you visit the site and that keeps a log of other sites you visit and your other internet activity. 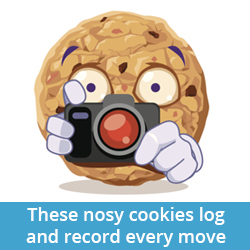 Most modern browsers allow you to turn cookies off, but many sites now disable part or all of their functionality until you agree to accept their cookies. And those are just the legitimate businesses! Criminals and rogue webmasters are also not in short supply on the internet, and will use even more malicious and intrusive methods to try to harvest personal information and install “malware” that allows them to remotely control your computer, access your files and monitor everything you ever look at or type while you’re online. Many “free” services on the internet aren’t really free. Sure, there’s a whole lot of email providers, social media sites, apps and file sharing sites that don’t charge you anything up front to use their services. But how do they make their money? Usually they display ads, but just displaying ads randomly doesn’t provide enough revenue to support potentially millions of users. They need to target advertising to individual users, and ensure these users click on the ads. The more data they can gather on you the easier it is to target you. They ask you for some data voluntarily, and that’s fine as long as you consent to it. But sometimes they harvest data in sneakier ways, either without informing you or by burying information about their data collection policies in a 15-page “Terms of Service” agreement. Even if you don’t enter personal information, many sites will collect data on you solely from your IP address. Your IP address is the unique number that represents your computer on the internet, and is visible to any website you visit or to any app that you run online. At this point you may be wondering how to surf or browse the internet anonymously. 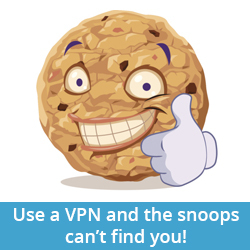 A Virtual Private Network (VPN) allows you to protect yourself from prying marketers, government snoops and criminals in an easy and convenient way. When you go online, you first log in to a VPN before connecting to anything else. The VPN acts as a proxy between your own computer and the rest of the internet. You can use a proxy to hide IP address from the sites you visit and blocks them from accessing any personal information about you or your computer. A VPN can even protect you when you are using public WiFi. And if you’re wondering how to hide IP address when downloading, a VPN also ensures the sites you connect to can’t see who you are. Security, privacy and freedom are basic human rights. When governments fail to protect your rights and companies refuse to respect them, you have to take matters into your own hands. When you hide your IP address with a VPN, it ensures you have the privacy you deserve when you browse, communicate and conduct business online. This is why I have separation with browsers that are “sanitized” every time I open/close them, and others for more personal use where I manage my cookies and cache every month or so. Also don’t forget to clear the flash cache, another way you can be tracked. I also pick extensions like ad block plus they block ads and malwares. for my online activities i keep them safe through purevpn. Things are getting very tricky in today’s time, we need to educate everyone on how to be safe online.